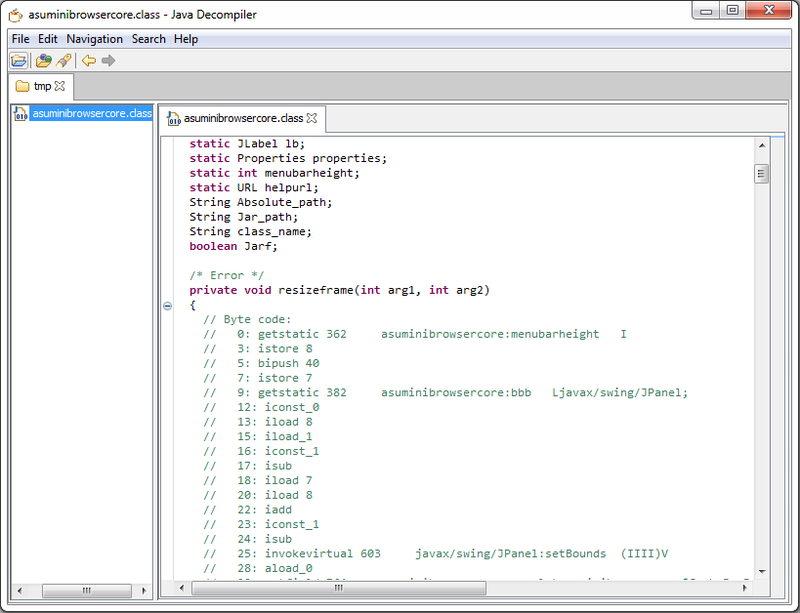 jhoja is a disassembler of Java class file. Convert Java class file to Jasmin assembler code. SWAG javap2 Ver 1.02 based. Re-assemble support Ascii code sources only. not support other character codes. jhoja support output UTF-8 strings. but Jasmin does not support UTF-8. if convert UTF-8 source to your local character code, may work on your locale systems. but it will be lost cross platforms. Decompile protection function support JD-GUI Decompiler. but does not support Jad Decompiler. What is the difference between jhoja and javap,SWAG javap2? jhoja support Jasmin assembler code. and jhoja support decompile protection function. Oracle javap and SWAG javap2 does not support them. javap2 does not support UTF-8. Decompile protection function does not affect the speed. but larger than normal class file. require Jasmin(Java assembler) and JRE or JDK. if use jhoja and Jasmin then easily crack decompile protection. 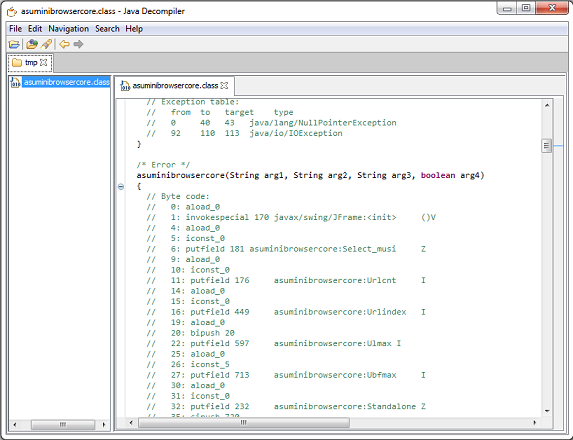 Examples: Decompile jhoja decompile protection class file by JD-GUI Decompiler. You can read any debug information in source comments. but re-assemble will be lost debug information in class file. Binary file support Microsoft Windows. Compiled by C++ Builder XE8. Written by C++. but allmost C.
if recompile may work on other OS. jhoja for Windows work on GNU/Linux for Intel/AMD CPU with wine. chenged 2-clause BSD license to Apache v2 licence. -g: Insert decompile protection code. does not Insert discompile protection code.